Once upon a time, deep in my classic rock phase, my then boyfriend remarked that everybody has that one musical guilty pleasure they tend to hide from view, lest friends and family find a reason to mock that appreciation. He smiled slyly at me and guessed I probably had a Madonna album sandwiched between my Beatles and Doors collection (I did), but it never occurred to me that Madonna probably had a few Carpenters vinyl platters hidden away somewhere. Little Girl Blue, Randy L. Schmidt's look into the life of this tragic legend, intimates that Karen can count some of music's trend-setters as fans, and that's okay. Repeat after me: it is okay to admit you like, even love, The Carpenters' music. Karen seemed to have held no shame in her role as a performer, and while reading Little Girl Blue (AMZ) I became more endeared to the woman behind the songs, even though I would still consider myself a casual listener. When The Carpenters enjoyed their peak recording and charting period, I was not likely representative of their audience demographic. By the time I developed an appreciation for popular music, it was all Duran Duran and MTV when The Carpenters would have been relegated to the easy-listening VH1 for moms and dads (you have to remember, this was way before VH1 essentially became MTV and MTV moved to Jersey). Nonetheless, when Karen died in 1983 I knew she was significant, and I watched the subsequent TV movie about her life. Blue reads somewhat like an extended version of that film, and it would appear both had been conceived under similar circumstances. In fact, Schmidt begins Blue with a short history of the movie, and how the creators met with roadblocks in the form of Karen's family, who stood protective of Karen's image and history - reading the rest of the book and the treatment Karen endured, a bystander might view these actions as attempts by the family to protect themselves. In the early passages of the book it's revealed that mother Agnes is adamant that she did not kill Karen, and already you get the sense that you're about to read 300 pages of familial discord. For two, when Richard's band moved from jazz instrumentals to vocal compositions, the world discovered Karen's other talent, which is more synonymous with the group's sound than her drumming. 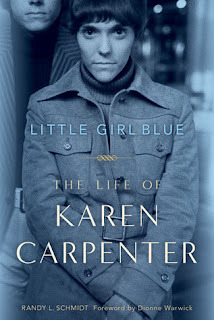 Little Girl Blue records the group's career with care, detailing recording sessions and tours and interspersed romances Karen found difficult to maintain - the theme of Karen yearning to be loved intimately pervades the book as we read of her mother's distant affection and husband Tom's love for her money. The more you read, the more you definitely sympathize for Karen. Of course, her eating disorder is covered, but unlike the movie which implies Karen's battle with anorexia began following a critical review of her looks after a performance (the article in question was later revealed to have been fabricated for the film) the book doesn't really pinpoint whether or not her anorexia and career pressures were related. It is possible, for even today actresses and performers are held to observe unreal standards for the sake of beauty, and unfortunately Karen could not be helped - as friends and family did seek to get her to eat and take better care of herself, what she did when backs were turned proved too deadly to reverse. As with many biographies I read here, general reviews are mixed. Does Little Girl Blue do Karen justice? I think Schmidt did the best he could with what he had - some may argue that the absence of family involvement gives this book credibility, that at least nobody has tried to sugarcoat Karen's story or disavow her personal pain. I found the story interesting but not wholly engaging - there were times I put the book down and left it for days while I did other things, I didn't feel compelled to finish it in one sitting. As an addition to Carpenters lore it provides a more accurate picture than the film, yet reads dry in parts and falls short of the same level of enthrallment that drew fans to Karen. Of course, it's difficult to compete with something like that. 4/25 update: Since posting this review, I have since gone back and sought out the Karen Carpenter TV movie, which is available for viewing via YouTube. If I have intimated that this book parallels the film, I should stand corrected in parts. One glaring item I notice in the movie is the implication that Karen bore the brunt of the disintegration of her marriage, almost to the point that it was her fault entirely. The book relays the exact opposite. Also, very little is mentioned of Karen's efforts to produce a solo album - in the movie, it's portrayed as an idea that Richard quickly dismisses. Kathryn Lively misses the 70s. The Karen Carpenter movie was co-produced by her brother. That may explain the 'glaring' items you mention. Since her death, Karen's brother has done everything to enhance his legacy. Understandable -- but not when it's done at the expense of Karen's. Thanks! I've found reading the book has helped me better appreciate Karen as an artist and person. Would be very interesting to see how she would have grown had she lived.